There are many homoeopaths around the globe who offer their services on Internet. One such doctor is Bombay's Dr Rajesh Shah. He starred the 'Homoeopathic information Cell' from his clinic in Ghatkopar this September. He claims to be the only doctor from Bombay to launch this facility.The launch came at a time where celebrating the bicentenary year of homoeopathy. "The concept of launching homoeopathic services on Internet took shape when I received an E-mail message from a Belgium based industrialist who was suffering from an attack of migraine headache for three weeks. He was not getting relief from any treatment." Dr Shah said, "Eventually, the industrialist thought of seeking help through the Net. A bank clerk from Canada recommended that he get in touch with me," he added. "The industrialist did so immediately and to his surprise received an E-mail 'homoeopathic prescription' for his headache. The medicine was taken by him, as recommended. By the end of 24 hours, the headache had gone." Dr Shah said adding, "He thanked me over the net. The last two lines of his message read. Thanks to homoeopathy, thanks to Internet, "I was thrilled to read those words." Khetwadi homoeopath Bhavana Trivedi, said, "The kind of homoeopathy practiced abroad. The internet facility can also be used for exchanging information between Indian and foreign doctors." 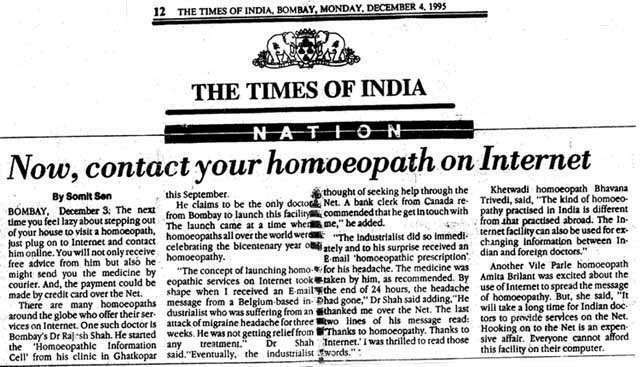 Another Vile Parle homoeopath Amita Brilant was excited about the use of internet to spread the message of homoeopathy. But, she said, "It will take a long time for Indian doctors to provide services on the net is an expensive affair. Everyone cannot afford this facility on his or her computer.